In August 2006, I spent a few days in Sweden together with my wife during vacation. 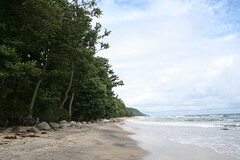 The most beautiful place we found was Stenshuvud National Park with a wonderful long long long sandy beach. There were only a few tourists, lots of nature, no buildings, hundreds of ladybirds. Sounds romantic and you bet it was a great place to celebrate our first year of marriage. We stayed at a B&B close to the park called EkenÃ¤s GÃ¥rd with nice rooms and fantastic breakfast. A really lovely place. Make sure you get the big room with the balcony should you intend to go there. i would like to travel to stenshuvud national park this august and wondered if you had any tips on how to travel from train to park without a car? We were driving there by car, all the way north from southern Germany and back. I think it will be hard to get around at Stenshuvud without a car. Maybe you want to call the tourist office in Simrishamn or Kivik. They speak English and can provide advice, maybe you can rent a car or bikes with their help. it was a wonderful vacaion, expecially if you like nature!